The 9 Best Garden Centers and Nurseries in Wyoming! With myriad typographies, all rugged and diverse, Wyoming is host to cornucopia of flowers, shrubs, trees and plants. When growing seasons roll around, there are a handle of worthwhile nurseries and garden centers that rise to meet demand. Here are the 10 best in the state. This downtown institution accumulates plants from around the globe, tailored to the eccentricities for Wyoming climate. The deep catalog runs the gamut: bright-blooming perennials, fruit trees, hearty grasses or creeping vines. Add to this impressive menu a smorgasbord of tools, supplies and fertilizers, and this is truly a green thumb’s one-stop shop. And if gardening is intimidating, classes are provided all season. Beautiful annuals from Wyoming Plant Company. Thanks for donating them! Be it flowers to greet summertime sunshine, or a billowing conifer come Christmas time, Riverbend’s got the goods. Doubling as a stone company, this garden center’s massive inventory offers an extended landscaping & decorative-rock selection. This nursery/stone yard is robust enough for commercial customers (contractors and the like), but also intimate and staffed such that the everyday gardener is equally welcome. Amidst it’s rows of healthy trees and flower-stuffed greenhouse, this nursery is also keeping with the times, offering an assortment of repellants and remedies for the devastating pine/bark beetle. This company’s play on words is truly apt. First, this garden collective focuses on plants that will thrive in Wyoming climates, which are deceiving high in elevation. Second, the staff, in the best possible way, are full of attitude: or more appropriately, passion for planting healthy plant species that will thrive in and bolster their environs. As such, Gardening with Altitude is focused on education, happily offering materials and instruction to best plant according to the environment. The Habitat Hero program is a cornerstone: focusing on building gardens and landscapes that benefit the ecosystem. Time to do some planting! For over three decades, Sweetwater has been a local staple, especially come planning season(s). Unlike many of its competitors, this nursery is open through December, allowing plenty of time (and materials) for those that’re behind the ball, attempting winter crops, or planning for next year. And if any advice is sought, it’s happily dispensed: staff here love to share their wisdom, recommendations and past tribulations. These experts in local ensure a pleasant shopping experience and, ideally, given the fickle nature of Wyoming climate, a healthy crop. A Colorado success story, with a genesis over 50 years ago, Grant Farms has since made a name for itself in downtown Cheyenne. A poster child for community supported agriculture (CSA), this nursery is built upon pillars of quality, organic and sustainable. And though these have since become ubiquitous buzzwords in the food world, the Grant Farms lineage truly walks the walk. And their outlet in Cheyenne is a proper distillation of these principles: the plants here are organically-raised, responsibly-sourced and of a pedigree that nearly ensures a beautiful (if not successful) garden. 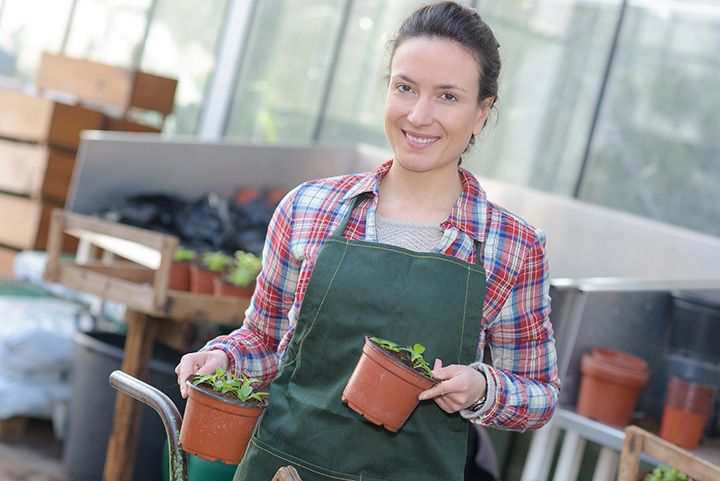 The wife-husband team here at the humble Porcupine Greenhouse have melded the best of their passion and expertise. Though existent for 40 years, this recent ownership has reinvigorated the brand: one can see their signature hanging baskets adorning downtown. Sure, they’re some excellent stocks here, and all the materials and know-how to help them take root. But the asset here is the personalization and intimate environment: people are on first name bases here. And a unique amenity: bring in an empty planter or garden box, and the staff will happily plant a gorgeous melange, with instructions for care, ready to take home and display. “Here for all your landscape needs,” indeed. Galles’ motto hits the mark. In addition to a fully-stocked rock yard for xeri- and landscaping, the garden center is chock-full of all the necessary materials: seeds and fertilizers, tools and gadgets, pots and potting-soils. Oh, and they’re plenty of plants, too. And in addition to all the luxuries of classes and instruction, this greenhouse also offers installation, both for its rock work and larger trees and shrubs. So, if some light reading, some staff instruction, a couple classes and top-notch materials aren’t enough to ease one’s gardening anxiety, leave it to the experts to deliver and install the plants well. Multi color Fall Mum in bloom! Any nursery worth its weight has decent plants. And tools and such. And some know how. But Aspen Grove certainly has them all in spades. The staff here is particularly friendly: very cool, passionate and informative. Tucked into the southwest corner of Wyoming, bordering Utah, this Evanston garden center has both foundational gardening supplies and neat eccentricities: the “fairy gardens,” small-scale dioramas with fully-stocked mini-gardens, are particularly adorable. In those spheres wherein terroir is crucially important, local is almost always better. But there are instances in which big-box selection is hard to beat. Lowe’s has literally everything a basic garden operation would require. The plethora of tools, fertilizers and materials available here is best used in conjunction with local seed and plant offerings of local nurseries.